Large holiday houses equipped for self-catering groups. Properties in England, Scotland, Wales and Ireland. Rent a cottage for 10-14 people? Two or three families, maybe four, or ten to twelve friends, plus a floating couple appearing mid week for a couple of nights or weekend break, (5-6 couples or a singles holiday!) 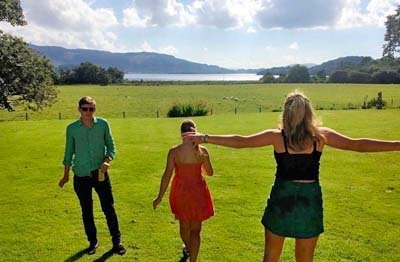 A large self-catering holiday house offers flexible accommodation for your group to stay in, a few tips to consider when booking the right cottage for your number of people. If you are from USA you may find standard bedrooms in UK and throughout Europe a little smaller than in the States. In England, unless detailed otherwise, self-catering houses for 10 to 14 people will be equipped with not just enough beds, but sheets and towels (all bedding), seats at dining tables to sit 10 - 14 guests, sofas or comfortable chairs for relaxing, Kitchen facilities including all important dining equipment - plates, glasses and cutlery! Larger houses will have more facilities and equipment, often games rooms and TV or cinema rooms are found in the really big rental houses. A wide range of houses with swimming pools - private or communal are available, but much in demand, our favourite is a beautiful indoor swimming pool in an English holiday house, reached through a conservatory, with an all weather tennis court beside the pool, it is very luxurious and welcoming and so attractive for 10 -12 people to rent! Cottages with log fires or wood burners generally allow a good usage of logs (check in the detail). If there is a garden, patio garden furniture and barbecue or pizza ovens may be a feature too, alfresco dining outside is very popular during the summer months. If you want to bring your house cat or rabbit on holiday, ask the property owners directly. Pets included or 'Pet friendly holiday cottages' generally assume a dog, some holiday houses are strictly 'no pets' which is good for those who suffer allergies. Vacation retreat in Somerset near Yeovil with 6 bedroom, sleeps 10, Pets friendly, Barbecue, Pub within 1 mile, Cot Available. A unique large holiday home in Derbyshire near Derby with 5 bedroom, sleeps 10, Pets friendly, Barbecue, Pub within 1 mile, Cot Available. Large holiday property in Cumbria near Glenridding and Southern Ullswater with 4 bedroom, sleeps 10, No pets, Pub within 1 mile, Cot Available. Accommodation for a large group in Devon near Chulmleigh with 4 bedroom, sleeps 10, Pets friendly, Barbecue, Ground Floor Facilities, Pub within 1 mile, Wifi, Cot Available. Vacation retreat in Shropshire near Craven Arms with 6 bedroom, sleeps 12, No pets, Barbecue, Ground Floor Facilities, Cot Available. Exceptional holiday cottage in Argyll and Bute near Taynuilt with 5 bedroom, sleeps 12, Pets friendly, Pub within 1 mile, Cot Available. Holiday house in Cornwall near St Ives with 6 bedroom, sleeps 13, No pets, Barbecue, Ground Floor Facilities, Pub within 1 mile, Wifi, Cot Available, Coastal Property. A double bed is for two people to sleep in - a standard double bed is 4 feet 6 inches wide and 6 feet 3 inches long (137 x 190 cm). this is the most common size of bed types in the UK. A king size bed is also for two people to sleep in - a standard king size bed is 5 feet wide and 6 feet 6 inches long (150 x 198 cm). This makes quite a difference if you are wanting luxurious lie in! Many holiday houses offer flexible twin bedrooms - good for children, single adults not wishing to share a bed and sometimes preferred by older, senior adult. Twin bed mattress dimensions are approx 38 inches wide by 75 inches long some adults, especially men can find these a little short. For ultimate space and luxury, a super king size bed again for two people to sleep in - but is bigger 6 feet wide and 6 foot 6 inches long (180 x 200 cm). A family room will generally have a combination of beds - maybe a king and twin beds - the zip and link beds are offered by many holiday houses as a versatile option, increasing the flexibility of the sleeping arrangements, you can easily split apart a king size or super king size divan bed into two single beds. Each divan bed is linked together and mattresses are zipped together, many holiday houses will have this option available. Sofa beds - for extra guests, not generally recommended for use as an additional bed for two adults for a week - although some people go for this option to keep costs down. Sofa beds are generally in the living areas, so space is compromised, but this can work well for an extra child or an adult who stays for the odd night. How many guest are accompanying you on this will sleeping 10 - 14 in a holiday house be big enough? Decide on the number of bedrooms and the number of beds. For 10 people you could rent a 5 bedroom house and have two in each bedroom, for 14 you could rent a 6 bedroom house with one bunk room, this may be cheaper than a 7 bedroom holiday cottage. Luxury holiday house in Argyll and Bute near Oban with 5 bedroom, sleeps 12, Pets friendly, Wifi, Cot Available, Coastal Property. Large country houses to rent in Ayrshire near Skelmorlie with 9 bedroom, sleeps 24, Pets friendly, Golf nearby, Sea View, Wifi, Coastal Property, Newly Listed Property, Private Hot Tub. Self-catering accommodation in Staffordshire near Leek with 4 bedroom, sleeps 12, Pets friendly, Pub within 1 mile, Cot Available.